More good bike news from the California legislature this week: The extensive and costly environmental reviews required for on-street bike lanes would be streamlined under a bill approved unanimously by the State Assembly on Monday. The bill, AB 2245, would relieve planners of needing to conduct environmental impact reports (EIRs) for bike lane projects, which are required under the California Environmental Quality Act (CEQA). The bill is expected to be signed into law by Governor Jerry Brown next month. 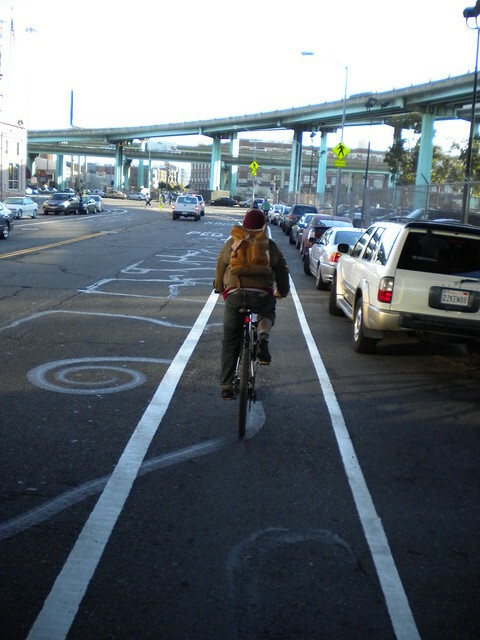 “We see this bill as a positive step in addressing the auto-oriented nature of CEQA, which has in the past stifled worthy bike lane projects that could help make bicycling safer, easier and more inviting to a larger share of Californians,” the California Bicycle Coalition wrote. AB 2245 requires cities and counties to prepare a traffic and safety study of the proposed bike lane project, conduct public hearings to discuss the project’s impact, and file CEQA-exemption notices with the state Office of Planning & Research as well as the County Clerk… Bike lane projects that languish in the environmental review process for up to two years could gain local clearance and exemption in a matter of months under AB 2245. AB 2245 was introduced by Assembly member Cameron Smyth of Santa Clarita to help expedite the Los Angeles County Bike Plan, which calls for over 800 miles of new bike lanes in the next thirty years. The bill is co-sponsored by Metro, a.k.a. the Los Angeles County Metropolitan Transportation Authority. Despite the major environmental benefits of providing safer streets for people to travel by bike, CEQA review for bike lane projects “can take anywhere from 12 to 18 months to complete, often costing more than the actual project on the ground,” the CBC notes. For the long-awaited protected bike lanes and pedestrian improvements on three blocks of Fell and Oak Streets, the SF Planning Department is currently reviewing the plan to determine how much environmental review is required by CEQA. That determination, planners say, will be a key factor in whether the project is completed by next spring, or possibly even later in 2013. To the chagrin of many bicycle advocates in San Francisco, bike improvements in the city were stalled for four years after Rob Anderson sued the city in 2007 for inadequate environmental review, as required by CEQA, of the SF Bike Plan. A judge placed an injunction preventing the city from making any bike improvements until the exhaustive EIR was finally approved. The extra review resulted in nothing except delays: When the injunction was lifted in August 2010, the Bike Plan remained essentially unchanged. Citywide bike plans could also be streamlined through the CEQA process under another bill making its way through the legislature known as SB 1380, which is expected to be approved by the Assembly this week. Stay tuned for more coverage of that bill. Wait, what’s Rob Anderson going to do with his time? You’re taking away his favorite pasttime, filing lawsuits to obstruct new bike lanes. I hope there’s some funding made available to help him find a new hobby. This is exceptionally good news. It’s disheartening to say the least when a bicycle lane project is delayed or cancelled due to the the result of an environmental review showing that LOS for motorized traffic might be reduced 20 years from now. Fantastic news! I’m actually surprised that it was a Republican legislator who introduced this measure — where were the Democrats on this? This should have been done years and years ago, immediately in the wake of the lawsuit filed by San Francisco’s favorite bike-hating troll. BTW does anyone know — is this measure only good for paint on the street? Or can it be used for physically separated lanes, too? San Francisco’s ridiculous experience on this front is, no doubt, the driver behind the bill. While CEQA does not, in fact, require the use of LOS as a measure, (see @ GC 15064.7(a)) this has become the de facto measuring stick. With the result that the courts readily consider any change to the roadway a fair argument. BAD court. BAD court. Jake, I think it should have been unnecessary to introduce the bill in the first place. CEQA gives agencies plenty of latitude to establish their own significance criteria (see my other comment after yours), which San Francisco has done, in the correct manner. And those non-LOS thresholds have withstood other legal challenges. it appears that the underlying purpose here is to instruct the COURTS better. By the way, traffic estimates are notoriously inaccurate. Sometimes as much as +/- 50%. Most traffic models ignore economic conditions, which, of course, have a very significant effect on automobile traffic. If anyone wanted to attack that in court, against required “mitigation measures” there is a very good argument to be made. Traffic models are almost pure vapor–good modelers know that. This would seem to be consistent with the language in MAP-21, where projects located within an existing right-of-way receive categorical exclusion from environmental assessment. I’ve only been a party to that one lawsuit, Foo, which hardly qualifies as a pastime. One of the above commenters is surprised that a Republican introduced the legislation, but he shouldn’t be. Republicans and their developer supporters hate CEQA as much as you bike people do, because it requires them to do environmental review of their projects. Like you they think that’s a great injustice! That’s who you folks are now allied with—the greedheads. Great political alliance! You have to have something plausible to replace LOS before you do that. Nor are LOS studies about 20 years in the future—though that might be included—but instead an attempt to determine the traffic impact of developments. Why is that a bad thing? Rob, read the working paper by Rajiv Bhatia, Directory of Occupational and Environmental Health if you wish to review and in-depth analysis of the flaws inherent in using LOS as part of a CEQA analysis. LOS is used to prioritize development of single occupancy auto travel over all other modes, including public transport and walking. The reason why we don’t have BRT, better walking facilities (like on-demand cross walks, or wider sidewalks for example), or slower speeds in residential neighborhoods is because of the fear of traffic congestion, and how it might trigger a CEQA reveiw. On page 8 of his report, he outlines a number of other indicators that could be used instead of LOS. CEQA Reform Update: Is This the End for LOS?